So as soon as I got home, I had to try to make these amazing little tacos, but with a little more low fat and low carb healthy choices. Yes, it takes is a little time, but the effort is worth it, in developing more layers of flavor. 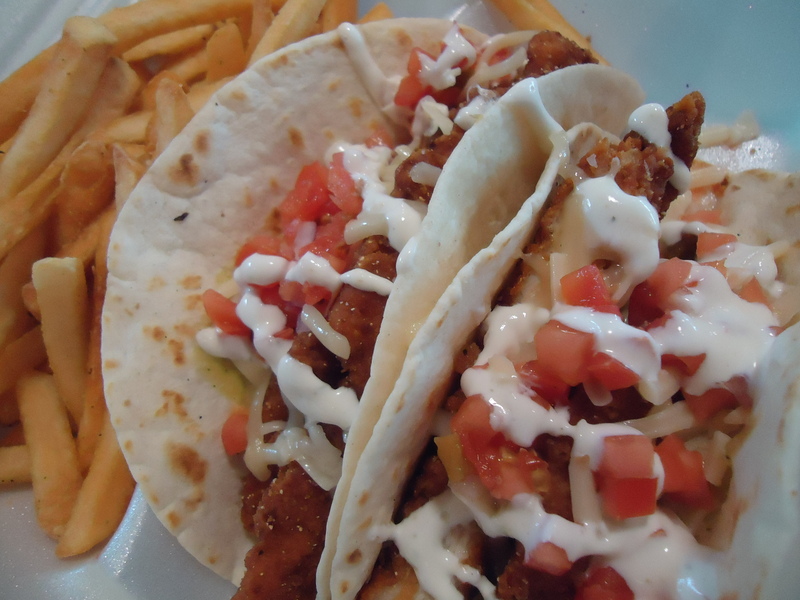 So here is my take on The Rum Bar’s Crispy Chicken Tacos. I oven baked the chicken tenders, rather than frying them, reducing the fat content. Also note that the avocado cilantro lime cream sauce is so delicious and it is also amazing on Chile Verde, chicken, fish, or seafood tacos. It is also great as a dip for vegetables and tortilla chips. As for a cooking tip, warming the tortillas is usually the last step when serving a Latin inspired meal for dinner. With a little heat, they get soft and pliable – perfect for wrapping around the filling. For the Chicken Tenders, combine the chicken tenders with all of the marinade ingredients in a large ziploc bag. Seal the bag tightly and gently message the bag to ensure chicken tenders are evenly coated with buttermilk marinade. Place in a bowl, just in case leakage that may occur from the bag and refrigerate for at least 2 hours. For best results, marinating over night is ideal. Remove the chicken tenders from the marinade and pat dry with paper towels. Discard the marinade. Lightly season the chicken tenders with salt and black pepper. In a shallow dish, season the flour with salt and black pepper then beat the eggs in another shallow dish with the milk. In a third shallow dish, place the breadcrumbs. Place the breaded chicken tenders onto a baking sheet and bake in the oven for 12 to 15 minutes, until golden brown.Remove from the oven and set aside and keep warm. To make the avocado lime crema, cut the avocados in half, lengthwise and remove the stones and peel. Place all the ingredients in a food processor and blend until smooth, place in a glass bowl and cover with plastic wrap to prevent further oxidation and set aside. To make the sour cream drizzle, in a small bowl, stir together the sour cream and the milk. Transfer into a small resealable plastic bag and set aside. To warm the tortillas making them more pliable, preheat the oven to 350°F.Wrap a stack of five or fewer tortillas in a packet of aluminum foil and put it the oven for 15 to 20 minutes, until heated through. You can do multiple packets of five tortillas each all at the same time. Alternatively you can also warm the tortillas in a microwave oven. Put five or fewer tortillas on a microwavable plate and cover them with a damp paper towel. Microwave in 30-second bursts until they are warmed through. Repeat in batches of five tortillas until all your tortillas are warm. To assemble the tacos, fill the tortilla in this order: spread a smear of avocado lime crema on the tortilla, add the chicken tenders and top with shredded cheese and a 1/2 teaspoon of diced tomatoes. Snip off one corner of bag and squeeze the sour cream drizzle onto the tacos, in a zig zag manner. Serve immediately with rice and black beans. Being on the Gulf Coast, there is a abundance of seafood and there is no place better than the State of Louisiana, and there’s nothing better than this classic Southern Creole dish during crawfish season. Generally, the crawfish season in Louisiana runs from mid-January through early-July for crawfish caught in the wild, with the peak months being March, April and May. Crawfish from farms are available over a longer period of the year. When out of season, you can switch to cooked crawfish that are available in the seafood section of your local super market. This is a great alternative, and if cooked correctly, tastes exactly like the live crawfish. There are hundreds if not thousands of recipes for Crawfish Étouffée, just as there are many cooks and chefs in the world. This is the old fashion Creole way to cook Crawfish Etouffee, with a blonde roux. Very simple yet very flavorful.But this recipe is easy and adaptable with ingredients you may have on hand. The important thing is to have celery, green bell pepper and onions to make the ‘trinity”, which is so common in Southern Cuisine. I used red onions, which will give you very different taste if you used white or yellow onions. The crawfish can be substituted with shrimp when crawfish are out of season. Even better when served with hot corn bread or a crusty French bread. Start cooking the rice first since this is a quick and easy dish. To keep the dish a bit more healthy, I used steamed brown rice for this recipe, but you can use whatever you like. Melt the butter in a large Dutch oven over medium-high heat. Add the onions, celery, and bell peppers and sauté until soft and golden, 10 to 12 minutes. Add the crawfish and bay leaves. Reduce the heat to medium. Stirring occasionally, cook until the crawfish begin throwing off a little liquid, 10 to 12 minutes. Dissolve the flour in the water. Add to the crawfish mixture and season with salt, cayenne, black pepper and white pepper. Stir until the mixture thickens, about 4 minutes. Add the parsley and green onions and cook for about 2 minutes. To serve, ladle the etouffée into shallow soup bowls and top of with a scoop of cooked rice. Serve immediately. 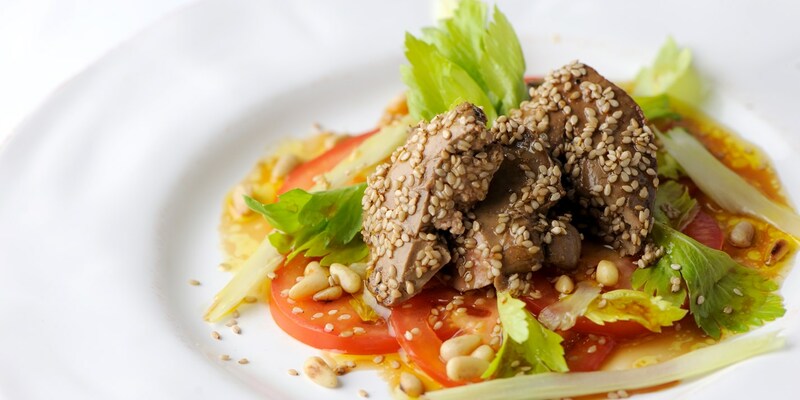 The delicate acidity and freshness of the salad serve to counter the richness of the duck livers in this recipe adapted from Chef Shaun Hill, with a sesame coating adding a pleasing crunch. Chicken livers can be used as a cheaper and more accessible alternative to duck livers if you cannot find them at gourmet or specialty meat markets. Place a frying pan over a high heat, add enough oil to the pan to coat the base. Season the liver with salt and pepper. As soon as the pan begins to smoke, sear the duck liver until dark golden brown. Reduce the heat and turn the livers over. Slice the tomatoes into 1/4-inch thick slices, season with salt and set aside. For the soy dressing, combine the peanut oil, soy and mirin in a small bowl and stir to combine. Place 5 slices of tomato in a tight circle in the center in the plate. Scatter some of the celery and celery leaves over the top and spoon over the dressing. Roll the livers in the sesame seeds to coat, then, slice on an angle. They should still be slightly pink in the center. Add the sliced livers and a small sprinkle of the pine nuts to the plates. Drizzle a little more dressing around the plate and serve immediately.